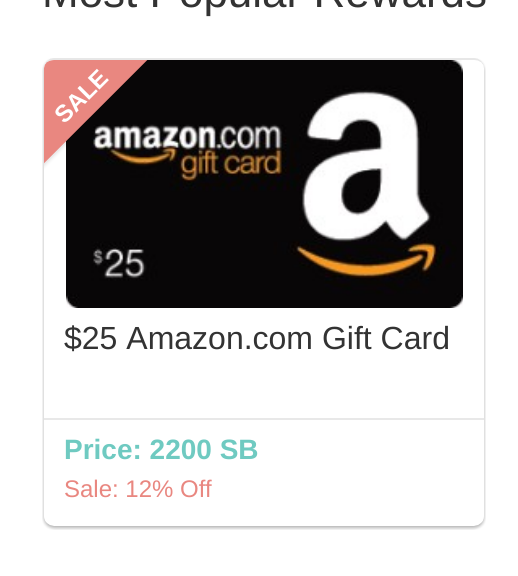 PS: make sure Amazon actual is the seller, and NOT marketplace sellers, otherwise you won’t get the $25 Amazon gift card! The link above points to Amazon’s own listing. 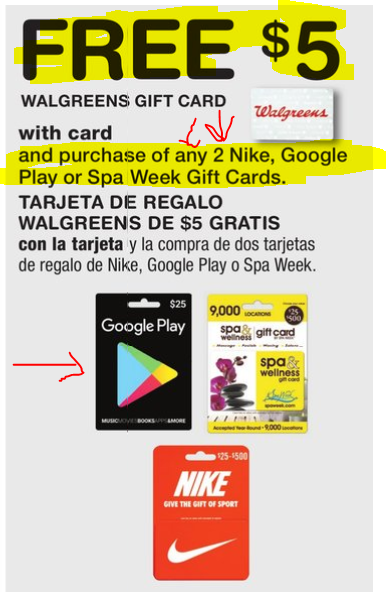 If you are participating in the SwagBucks rewards program, and you haven’t redeemed a gift card this month yet, there is a promotion running that let’s you redeem 2200 SwagBucks for a $25 Amazon gift card. That’s better than the typical 1:1 ratio! Cordcutters! Did you know you can save on your Netflix monthly fees? You can’t get a direct discount from Netflix, BUT you can buy Netflix gift cards at a discount, and apply them to your own Netflix account. Thus getting an indirect discount! Which brings us to Rite aid brick and mortar stores. Good until Saturday at the close of business (that’s January 27 in 2018), you can buy a $25 Netflix plastic gift card, and receive $5 back in Rite Aid rewards (which you can begin spending the next morning at Rite Aid). This roundabout promotion is a 20% savings, assuming you’ll have no problem finding things to buy at Rite Aid. The promotion is limit two per customer for this week, so $50 in Netflix should keep your account running for about 4.5 months if you have the default Netflix plan. 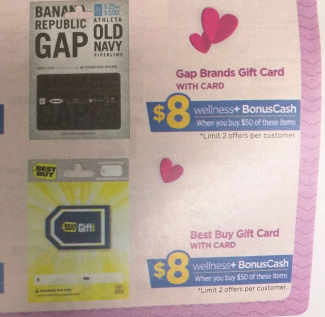 Note that the GAP and Best Buy offers are $8 Rewards BUT with the purchase of $50 gift cards, not $25 gift cards. 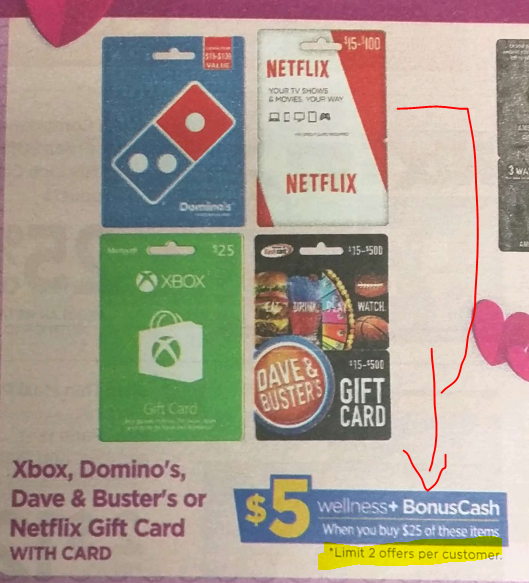 The rest of the retailers (Bass, Cabellas, Dominos, Xbox, etc) participate in the $5 rewards for $25 gift card promotion. Speaking of Peet’s Coffee, Living Social (now owned by Groupon ~ which is why their website looks a lot like Groupon with a different paint job) has an invite-only promotion an electronic Peets e-gift card. Invite-only offers work only if you received an email from LivingSocial that you are eligible for the promotion. Or you can login to your account and try to buy it and see if it allows you or not. To cut a long story short, for a limited time, you can get a $10 Peets e-Gift Card for $5. That’s a 50% off discount, a great deal for sure! You can use the gift card at the Peets B&M stores or their website. While surfing around the Books section of the Google PLAY store, with a browser or when using the Google PLAY actual app, you may see a promotion that gives you a $5 credit any book purchase of $5 or more! There are two deadlines to pay attention to. First, you must activate the offer by 9/30/17. Once activated, the promotion runs until 10/12/17. If not used by that time, it will simply expire. You can verify the offer is in your account, check under “Account”, and page down to the “Rewards” section. You should see the offer there, along with the terms and expiration date. If you are a regular Starbucks shopper, and you pay attention, you can find some good deals from time to time on getting discounted gift cards. One such promotion is right here, right now! This promotion is a combination of CashStar (a gift card service) and VISA Checkout (VISA’s online payment service). If you purchase a $10+ electronic Starbucks gift card, during this promotional period, they will automatically load an additional $10 to the e-gift card. So if you buy $10, you’ll get $20. If you buy $14, you’ll get $24. The promotion is at the Cashstar website. You don’t need a Cashstar account but you need to have a VISA Checkout account. If you don’t, fear not, you can easily create one with most VISA credit cards. Then after you create and activate that account, you can take advantage of the offer. The promotion is once per account, and it expires by 9/30/17, or earlier if the promotional amount set aside for this is expended. Per the Terms and Conditions, a total of 225,000 offers are available. So don’t sleep on it! 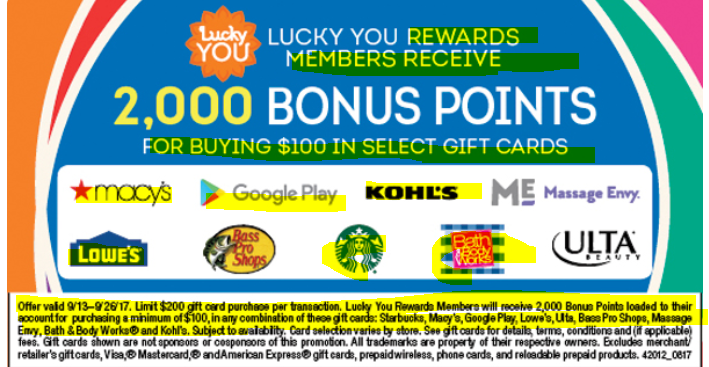 Parallel and separate from the Lucky’s Gift Card promotion, Safeway’s warehouse chain store, Smart and Final is running its own 10/50 gift card promotion. The terms are similar. 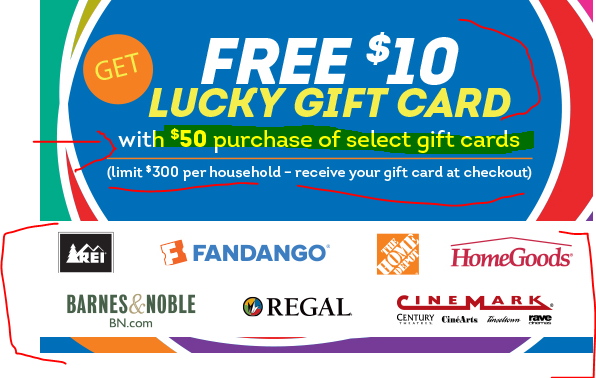 If you buy $50+ in eligible gift cards, the Smart and Final cash register will spit out a coupon that will get you a $10 off discount towards your NEXT purchase at Smart and Final. Next can be right after you pay for the gift card purchase. 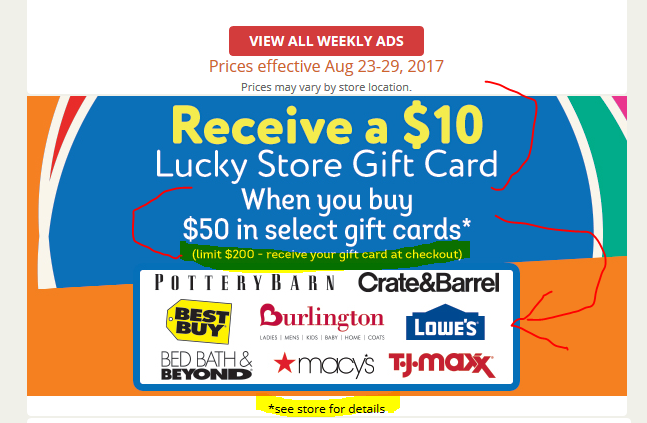 This promotion runs between June 7-20 in 2017, that’s two weeks worth of shopping. 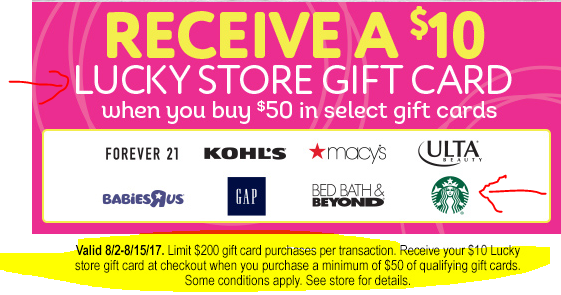 Eligible retailers for this promotion include Best Buy, Lowe’s, Nordstrom, Nike, Panda Express, BJ’s, Regal, and more! It’s a two-in-one bundle! If you buy the Rachio Smart Sprinkler Controller (eight zone, second generation model) for its regular price of $200, for a limited time, Amazon will include in your package a $50 plastic Amazon Gift Card! You don’t have to enter any coupons or do anything else, just add the bundle to the shopping cart and proceed. This is handy now with Dads and Grads gift giving season, having an extra $50 Gift Card around can be handy in case of “gifting emergencies”. You can buy as many bundles as you like!